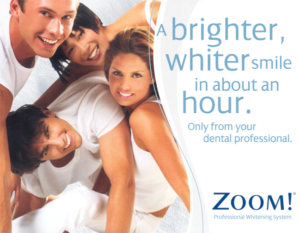 Have your smile make a statement with brilliant white teeth that truly shine. Zoom! teeth whitening is an option for those who want a brilliant smile. This is a bleaching process done in the dental office that doesn’t take a lot of time to complete. It is used to lighten the color of the dentin of the teeth as well as the enamel. There are several reasons why someone would want to use Zoom! whitening. It is commonly used by people who have teeth that are discolored from drinking beverages like coffee or tea over a long period of time or those who might have discolored teeth due to smoking. There are also people who might want whiter teeth as they get older because aging can cause the teeth to appear discolored. Zoom! professional whitening procedure is a great way to get brilliant white teeth that truly shine. If you’ve ever wanted whiter teeth, we would love to discuss whitening options with you. 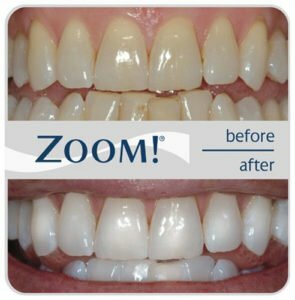 A consultation will help us see the best option for you and most people are great candidates for Zoom! The dentist will discuss the bet options when it comes to whitening the teeth, but most people are candidates for the Zoom! procedure. During the consultation, the gums and teeth are examined to make sure they are healthy and that there is no gum disease that might be made worse by the bleaching agents that are used. Teeth whitening is something to consider by those who plan on other cosmetic procedures, such as veneers. Whitening is commonly used after people have braces removed in order to have the teeth the same shade throughout. The condition of the teeth will be examined as brittle teeth and teeth that have cavities might not be able to withstand the bleaching. The Zoom! procedure only takes about an hour to complete. Most dentists will recommend that the teeth be cleaned before the procedure. The gums and lips are covered before the procedure begins. This will leave only the teeth exposed in the mouth. The hydrogen peroxide gel is then applied to the teeth. A light is used to penetrate the teeth to give the best results possible. The gel will stay on the teeth for about 15 minutes before it is removed. While the gel is on the teeth, the patient will remain in the chair and relax. There are three sessions of whitening, each lasting for 15 minutes. A fluoride paste is applied to the teeth after the final session to strengthen the teeth.